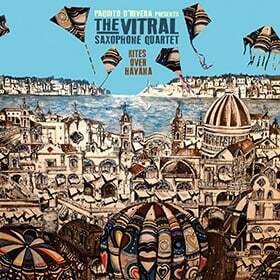 " Already established in NYC since 1980, my both personal and working relationships with Pablo Zinger, Carlos Franzetti, Jorge Dalto, Diego Urcola, Pablo Ziegler, Raul Jaurena, Lalo Schifrin and so many other Argentine and Uruguayan musicians make the present recording sort of the natural result. This time under the musical directorship of my dear friend Pablo Aslan." In the family of music, jazz and the tango are cousins: Both are the products of Africa, Europe and the Americas; of New Orleans, Havana and Buenos Aires; of swing, the blues, the clave and the milonga, all brought together by a New World blend of Spanish, Black, Caribbean, North and South American peoples. The multi-talented clarinetist/alto saxophonist/composer/bandleader Paquito D’Rivera – a fourteen-time Grammy winner, and the only artist to have won Grammies in both Classical and Latin Jazz categories – understands all of the myriad inventions and dimensions of those musical genres. His latest release, Tango Jazz: Live at Jazz at Lincoln Center, recorded in New York City in March 2010, is a scintillating live document, featuring the great Argentine bassist Pablo Aslan, pianist Abel Rogantini, violinists Nicolas Danielson and Pablo Agri, trumpeter Gustavo Bergalli, Michael Zisman and the legendary Raul Jaurena on bandoneon, and drummer Daniel Piazzolla, grandson of the immortal tango master Astor Piazzolla. They successfully continue the leader’s tango-centric focus he started on his 2007 release Funk Tango. For D’Rivera, his love affair with the tango is nothing new: it goes back to his days growing up in Cuba listening to Argentine music on the radio. "Names such as Libertad Lamarque, Pepe Biondi and Hugo del Carrill filled TV and movie screens throughout the island, and while listening to the local radio stations, we learned to admire musicians such as Marianito Mores, Anibal "Pichuco" Troilo and the immortal Carlos Gardel," D’Rivera writes from the CD liner notes. "Much later, around 1970, my friend Alberto Romeu played for me that Astor Piazzolla LP that sealed forever my love for the Tango and the sublime bandoneon, it’s most emblematic instrument." D’Rivera’s love for the tango, rendered in a Latin jazz context, is evident on the eight tracks on this CD. The leader’s lovely laser-like clarinet and sax freely float over the crisp staccato, poetic percussive habanera/River Plate rhythms that imbue the tango with its beauty and buoyancy. "Viejo Smocking," "Beto," and "Close Encounter of the Fourth Kind" all swing with a brisk, 4/4 feel, contrasted by the lilting and lovely ballad-style offering "Bandoneon," the danceable take on the American standard "Goodbye," the Cubanesque "Tangoguajira," and the peppery, contrapuntal "Verano Porteno." In the hands of a lesser-talented musician, this marriage of jazz and tango would be quickly annulled. Thankfully, Paquito D’Rivera has been a successful matchmaker of many musical idioms for four decades. Born in Havana in 1948, D’Rivera emulated Benny Goodman on the clarinet, drank in the bebop of Charlie Parker and Dizzy Gillespie, as well as the many native Afro-Cuban musical traditions all around him, and played in the Cuban National Symphony Orchestra. In the sixties, he co-founded the Orquesta Cubana de Musica Moderna, and the supergroup Irakere. D’Rivera defected to the U.S. in 1980, and has recorded over forty records as a leader, including Blowin’ (Columbia 1981), Manhattan Burn (Columbia 1986) Cuba Jazz: 90 miles to Cuba (RMM), Portraits of Cuba (Chesky, 1991), The Jazz Chamber Trio (Chesky, 2005) and Funk Tango (Sunnyside, 2007), which earned him a GRAMMY for "Best Latin Jazz Album" that same year. He wrote the book, My Sax Life published by Northwestern University Press in 2005, and a novel, Oh, La Habana, published by Recorded Books, LLC. A master educator, D’Rivera currently serves as Artist-in-Residence at the New Jersey Performing Arts Center (NJPAC). D’Rivera was also featured in the Latin jazz documentary, Calle 54 (2001). 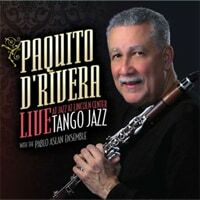 On Jazz Tango, Paquito D’Rivera shows that, through jazz, all of the world’s far-flung music can come together. "Jazz is the most representative product of a multinational and polycultural society like America," D’Rivera writes in the CD liner notes, "so there was no better place to make this recording, other than at Jazz at Lincoln Center, and no one better than Pablo Aslan to put together this old dream of mine of a genuine Tango Jazz recording."